By now you’ve probably read about a momentous recent decision, and the very public reversal of that decision, made by Maker’s Mark, a distiller of small batch bourbon based in Loretto, Kentucky. The basic story is this: in February, Maker’s Mark announced that they would be reducing the alcohol content in their bourbon from 45 percent to 42 percent, ostensibly in order to boost supplies of its product to meet high consumer demand. A mere week later, after a firestorm of protest erupted on social media and the Internet in general, the company reversed course. Pundits in the business press referred to the snafu as the company’s “New Coke Moment,” a reference to Coca Cola’s notorious decision (and subsequent reversal) in the mid-1980s to change its soft drink formula. As a fan of the Maker’s Mark brand (in moderation, of course, and in Manhattans) I followed this story with some interest. However, as the story evolved, the whiskey drinker in me retreated, and the marketer started to pay more attention. And I began to ask the question: what if the whole affair were not a mistake at all, but instead, a masterstroke of social media marketing? 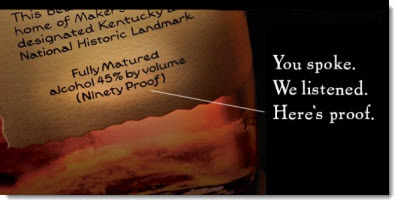 Point #2: according to Forbes Magazine, on February 9 (before the initial announcement) Maker’s Mark’s “Attention Score” was 8, meaning that roughly 8% of the 21 and over US population had heard of the brand. On February 17, the day the reversal was announced, that score was 14. On February 27, the score was 24, the highest the brand had scored in six years. Measures of brand perception, meanwhile, took a beating upon the initial decision, but that trend reversed quickly, and at last count the numbers were almost recovered to their original levels. • Not prone to such business errors? Consider, then – what “mistake” could you make, promptly reverse, and leverage to the hilt in the interest of brand awareness? The possibilities are endless. Cheers! This entry was posted in B2B Marketing, B2C Marketing, Branding, Campaign Strategy, Social Media and tagged brand awareness, forbes magazine, maker's mark, mea culpa marketing, Social Media on March 6, 2013 by Howard Sewell.